These garnet cross stud earrings in 14K white gold from Apples of Gold Jewelry make a gorgeous pair of stud earrings that you will want to wear for every occasion! These beautiful 14K white gold stud earrings are shaped like slightly rounded crosses and measure 7.29mm by 5mm (5/16" by 3/16") each in size. The earrings have friction post and back closures to keep them in place during wear. 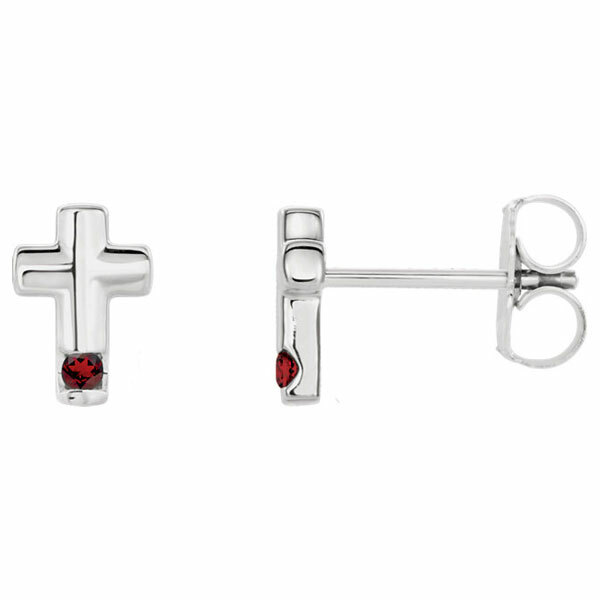 At the bottom of each white gold cross is a genuine, deep crimson garnet gemstone. The garnet stones measure 1.5mm garnet per ear, and come alive when paired with the white gold of the earrings. We guarantee our Garnet Cross Stud Earrings in 14K White Gold to be high quality, authentic jewelry, as described above.